Friday morning at 7:30 am. Lawn Maintenance parks on Murray Hill ROAD.Not a dead end street. It is posted on the pole no parking with an arrow pointing directly where these trucks are parked. The sign is there for a reason. This situation now leaves only one passage to travel up and down Murray Hill ROAD. Cone means nothing when you are in violation. Yes, it was a dangerous situation waiting to happen. Winding road, no visibility, speeding cars going to work or school. I also witnessed this situation. Unnecessary comments to previous poster. As you can see from the first “disaster” complaint, it shows Murray Hill Park as the location on the map, which is a dead end. After diverting police resources for this “potential disaster” the police units on scene found no obstructions on Murray Hill rd. The current picture shows a much better view of what is occurring. We will be happy to educate the driver when encountered in the future. If we had a phone call or contact number when you made the first complaint then all this could have been avoided. It is my hope the city will consider eliminating the anonymous posters for this service . The police have anonymous tip lines for those types of complaints requiring anonymity. Traffic complaints shouldn’t qualify and only create confusion and misunderstandings. 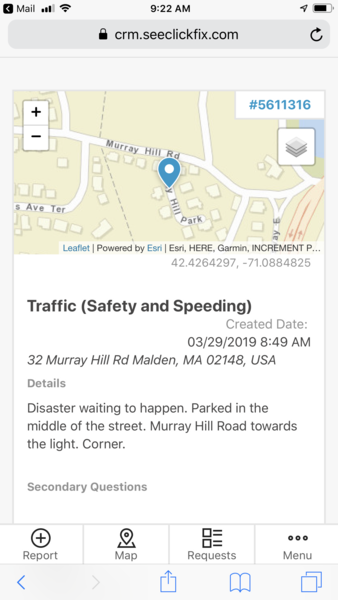 You can view the attached screen shot of the first complaint with the pin map showing Murray Hill Park and the location. Tree fell on the light post for the walking path at the east side of Fellsmere park three years ago, they took away the broken post, we had been requested to replace the broken light post as safety issue for the last two years, please replace the lightpost at the walking path, after three years, DPW still have not replace light post and to restore safety for the park.